Thanks to National Library Board for the invitation and Toa Payoh Public Library for sponsoring the venue, I will be conducting free public stargazing talks this coming weekend. 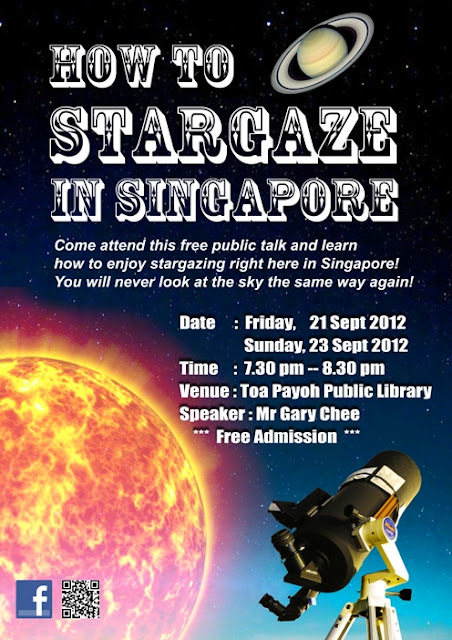 If the sky is clear, my friends and I will be conducting free public stargazing session at open space outside the library after or during the talks. All are welcomed! This is the most efficient one hour you can spend to get to know more about stargazing in Singapore and if it is a suitable hobby for you to take up (answer is yes. :)).